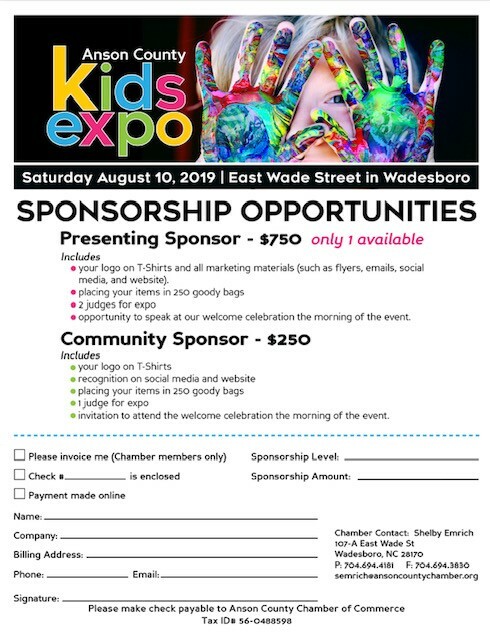 The Anson County Kids Expo is the Chamber’s new event that focuses on the next generation of entrepreneurs and business owners. The event offers kids (grades K-12) an opportunity to create, develop and market a product or service that they are passionate about. Strictly for kids only, adults are not allowed to help sell or market the child’s product or service. The event is not only a showcase for the children, but an opportunity to understand the elements of owning one’s own business. The kid vendors will learn and use real life skills such as math, communication and creative thinking. Development and marketing of their product or service will have an impact on their sales at the event and offer them some insight into what it takes to own their own business. WINNERS WILL RECEIVE PRIZES AS WELL AS THE OPPORTUNITY TO PROMOTE THEIR BUSINESS THROUGH THE ANSON COUNTY CHAMBER! The Kids Expo will be held on East Wade Street, between Washington Street and Lee Avenue. If your child will need help with set-up materials such as a tent, table, chairs – please contact the Chamber office. We want every child interested in participating to be afforded this opportunity. Please let us know how we can help so your child can apply! Applications will be vetted through a committee of Anson County Chamber Business Members. We will accept up to 50 applications. Approvals will be emailed. Applications will be available on Friday, April 25. For more information contact Shelby Emrich at semrich@ansoncountychamber.org.